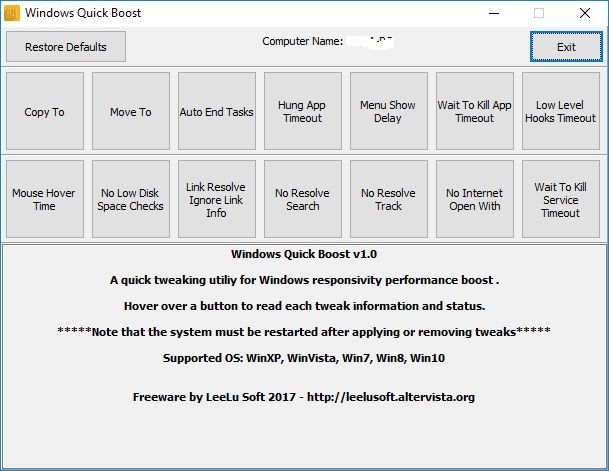 Quick Settings Launcher is a free and portable one click launcher for different Windows10 settings pages. The Windows10 settings application can be a little confusing sometimes, Quick Settings Launcher is a mini utility that provides a simple and Straightforward list of all the settings pages and a one click launcher for each page directly. Quick Settings Launcher is a portable application, installation is not needed, just unzip and execute SetQL.exe. The application can run from any folder or removable drive. Supported OS: Windows10, some pages may also work with Windows8/8.1 (never tested). Whether a settings page is available varies by Windows SKU. Not all settings page available on Windows 10 for desktop are available on Windows 10 Mobile, and vice-versa. also additional requirements (hardware or software) may be needed for a page to be available. 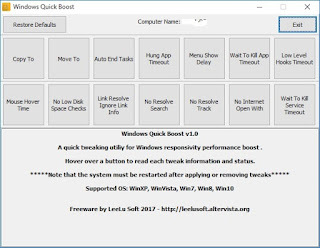 Windows Quick Boost is a free straightforward and portable (no installation) tweaking application to improve Windows responsiveness performance. It is based on a safe collection of registry changes, the user can select which one to deploy and the application also offer a one click way to restore this tweaks back to the Windows default settings. The interface is very simple and straightforward while providing information and status on each tweak. The application is running as admin, this is needed for registry changes. Supported OS: WinXP, WinVista, Win7, Win8, Win10. -Application will ask to run as admin, it must run as admin to work. -A Collection of safe registry tweaks to improve Windows responsiveness performance. Important: System must restart after applying tweaks! 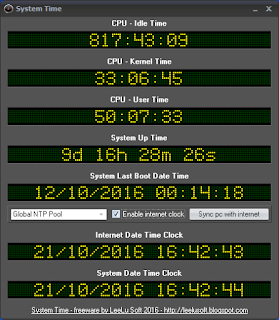 System Time is a free system time information utility for Microsoft Windows platform. 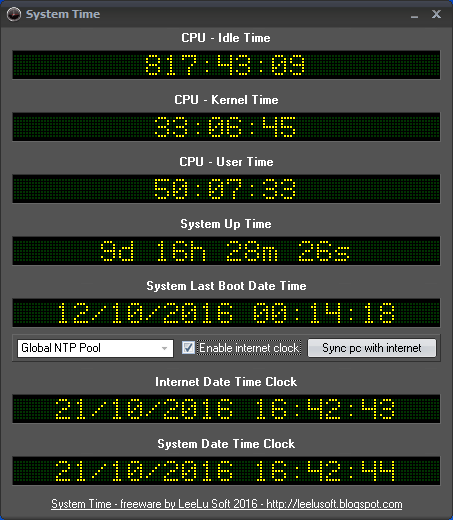 • Watch the system's up time and the last boot date. • Enabling the network time protocol requires internet connectivity, if internet date time is not displayed or displayed incorrectly, disable internet date time using the check box, select a different NTP pool and enable internet date time again. System Time is a portable application, installation is not needed, just unzip and execute SysTime.exe, it can run from any folder or removable drive. After a long time without any maintenance due to other obligations, the blog was refreshed. All the official download links are pointing to portable versions only!, no more installers! Also the security issues with Google on our main site are resolved now and the main site is accessible again. 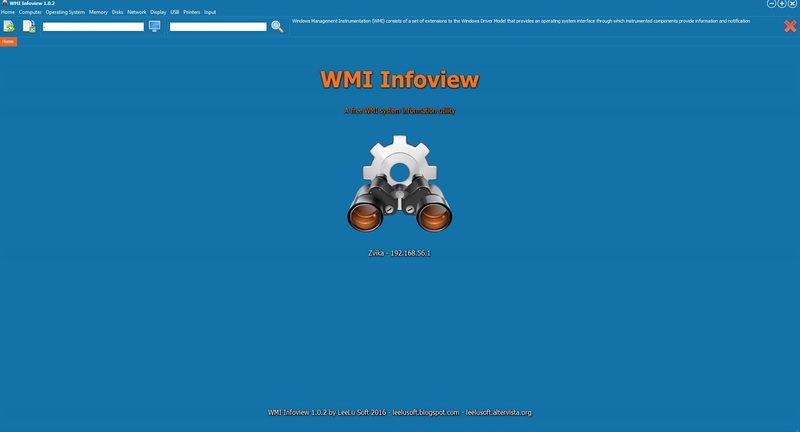 WMI Infoview is a free WMI based system information utility for Microsoft Windows platform. It can provide a huge amount of information about your PC and Windows OS. Jango 2.0 for Linux, a GUI Linux desktop application that let you encrypt and decrypt files using a variety of ciphers (17) and hashes (10) combinations to select from. Jango 2.0 is a portable application, you just need to extract the file from the ZIP folder and execute it. 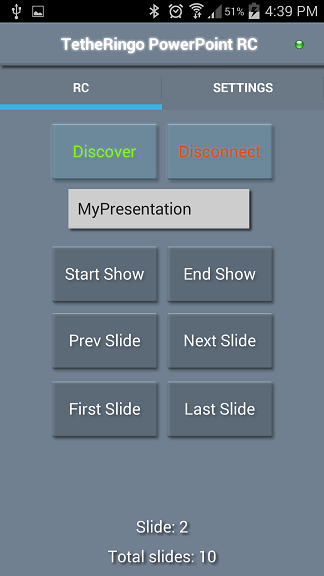 TetheRingo is a mobile companion app that turn your mobile Android device into a PowerPoint presentation remote control. With TetheRingo you can control a PowerPoint presentation running on your Windows PC, start / stop presentation, move to the next / previous slide or jump to the first / last slide. • The TetheRingo Remote Control app, which can be downloaded for free from Google Play Store, this app runs on you Android mobile device. 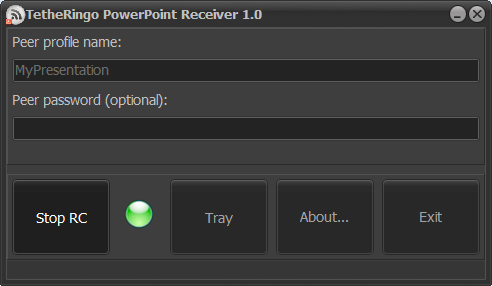 • The TetheRingo receiver, which can be downloaded for free from http://leelusoft.altervista.org/tetheringo-powerpoint-rc.html , this app runs on your Windows PC where the presentation runs. Both, the mobile device and the Windows PC must be connected to the same wireless LAN so they can discover each other. • Download the TetheRingo receiver to your Windows PC, open the zip file into any folder and run it (no installation is needed). 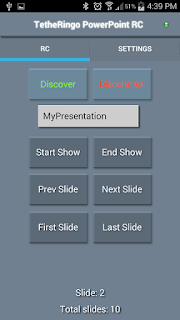 • Open your local PowerPoint app and load a presentation (no need to start the show, just open a presentation). • From Google Play Store, download and install TetheRingo RC on your Android device. • Go to your PC, enter a peer profile name or just leave the default one (MyPresentation) and click "Start RC"
• Go to your mobile device and launch TetheRingo, make sure the same peer profile name appears under the settings tab, and click on "Discover"
• Give it a few seconds to discover the peers and to connect, when connected the peer name will appear on the Android device and the connection leds on both sides will turn green. 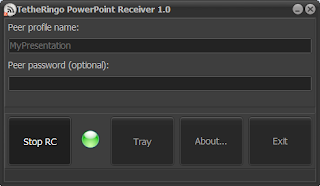 • Now, on the RC, click "Start Show" and control your presentation. TetheRingo also let you set a connection password between peers. In case the of a high load on the WiFi network, the TetheRingo RC may not discover the receiver, let it search for a few seconds, and if doesn't find the peer, just click again on "Discover" and wait for a few more seconds. After reaching thousands of downloads on Windows platform, Phonetico Toy is now available also for Android devices (2.3 and up). Phonetico Toy is a multi-translator that can translate between English alphabet, NATO phonetic alphabet, Western Union phonetic alphabet and Morse code. It translates everything to everything, which means you can enter a phrase in any of the supported alphabets and Phonetico Toy will translate it to all the others. Phonetico Toy can also speak the results (text to speech must be installed and enabled on the device) and play the Morse code. The results can also be copied to clipboard or shared with any supported apps. 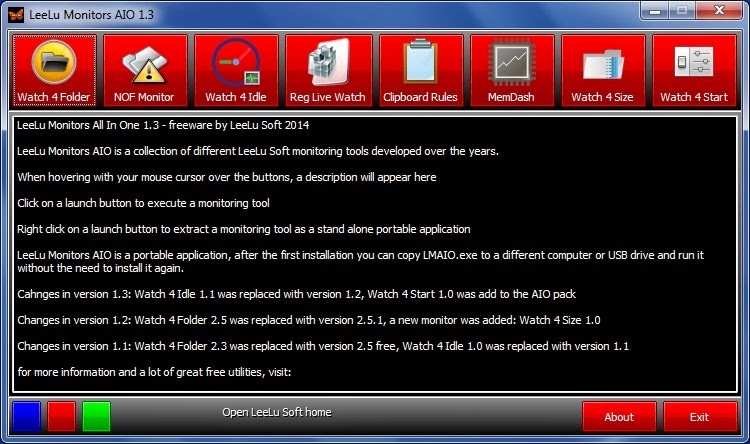 LeeLu Monitors AIO is a collection of different LeeLu Soft monitoring tools developed over the years. When hovering with your mouse cursor over the buttons, a description will appear in the main window. LeeLu Monitors AIO is a portable application, after the first installation you can copy LMAIO.exe to a different computer or USB drive and run it without the need to install it again. 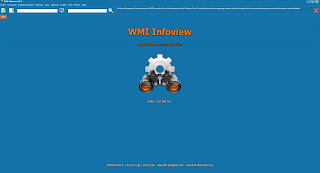 The installation package will also extract user guides for all the monitoring tools into the target folder. And that is not all, each of the monitoring utilities can be extracted as a stand-alone and portable application that you can run from your USB stick or on a different computer. - Watch 4 Folder 2.5.1 - a folder activity monitoring and automation tool. - NOFMonitor 1.0 - monitors a folder for changes in the files count. - Watch 4 Idle 1.2 - monitors your computer for idle and resume from idle. - Registry Live Watch 1.1 - monitors your Windows registry for changes. - Clipboard Rules 1.0 - Monitors your clipboard for specific text strings. - MemDash 1.0 - a simple applet that display a graphical presntation of the various memory aspects. You can also extract each monitoring utility as a stand alone and portable application, just right click on any of the launch buttons and select to extract. This will extract the selected utility to the folder from which you executed LMAIO.exe. Watch 4 Idle 1.1 was replaced with version 1.2. Watch 4 Start was added to the AIO pack. Watch 4 Folder 2.5 free was replaced with Watch 4 Folder 2.5.1 free. Watch 4 Size was added to the AIO. Watch 4 Folder 2.3 was replaced with Watch 4 Folder 2.5 free. After a long time using Blogger as our main site, we launched our new site. This Blog will continue to be maintained as usual. The new site features a clean and simple view, menus and categories for easy browsing our software archive, direct download links and more. LeeLu Soft products are free for private and non-commercial use only. Running and maintaining LeeLu Soft requires a lot of time and efforts. Developing new high quality and reliable utilities is a hard work. So if you like using my Free software, Please consider showing your appreciation by donating any amount you feel like. We've partnered with PayPal to make your donation safe, fast and easy. LeeLu Soft Blog. Awesome Inc. theme. Powered by Blogger.